Fiorina CRUSHED Hillary With THIS Claim! ….It’s About To Go DOWN! 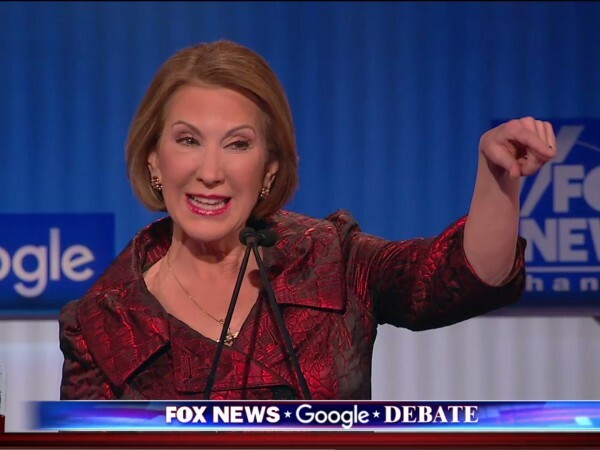 It’s always a pleasure to watch Carly Fiorina crush Hillary Clinton like this. She scored big when she nailed Bill and Hillary during the debate last night. It was epic. I especially liked her comparing Clinton to murderous drug lord… it’s apropos. Although El Chapo may not appreciate the comparison much. Just sayin’. Fox moderator Martha MacCallum stated that in a previous debate, Fiorina said that “unlike the other woman candidate in this race, I actually love spending time with my husband” — to which Fiorina smiled and pointed at her husband, saying, “He’s right there.” MacCallum continued: “But back in September, in an interview, you said that you would stick only to the record — your record vs. Hillary Clinton’s record — and never resort to personal attacks. What changed?” Fiorina responded that her previous comments were not “a personal attack.” “I was pointing out the fact that Hillary Clinton will do anything to gain and hang on to power. Anything,” Fiorina said. “Listen, if my husband did what Bill Clinton did, I would have left him long ago.” Hillary Clinton is one of the most ruthless, ambitious women I have ever seen. There is nothing she wouldn’t do to win the presidency. Fiorina perfectly captures the essence of Clinton and exposes it. Funny, it’s usually Bill who is exposed. Des Moines, Iowa – During the Fox News under card debate tonight in Iowa, GOP presidential candidate Carly Fiorina suggested Hillary Clinton is more qualified for the “big house” than she is for the “White House.” The comment was clearly a reference to Clinton’s ongoing legal troubles as the FBI expands its criminal investigation into her hosting of top secret, classified information on a private email server and into potential corruption surrounding decisions made at the State Department to benefit the Clinton Foundation. Carly was nowhere near through with the Hildabeast: “Here’s the deal: Hillary Clinton has been climbing the ladder to try to get power and here now she is trying for the White House,” Fiorina said. “She’s probably more qualified for the big house.” She then compared Clinton to the recently captured Mexican drug lord Joaquin “El Chapo” Guzman. “She’s escaped prosecution more times than El Chapo,” Fiorina said. “Perhaps Sean Penn should interview her,” Fiorina zinged. She then covered the insanity of Clinton’s foreign policy. But the most priceless moment came towards the end: “You see, it’s called the ‘Clinton way,’” Fiorina said. “Both Bill and Hillary practice it — the Clinton way, say whatever you have to say, do whatever you have to say, lie as long as you can get away with it. Hillary Clinton cannot be the president of these United States.” Fiorina will not get the nomination, but man… she deserves a prize for eviscerating Hillary like this.